Bookride: Creative Illustration. Andrew Loomis, 1947. Andrew Loomis, CREATIVE ILLUSTRATION. Viking, NY 1947. 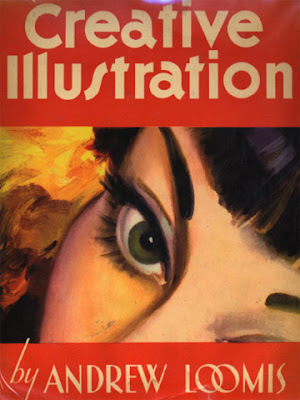 From the blurb to later editions: 'Intended for the artist who wishes to make illustration a career, rather than for the early efforts of the beginner or for those who draw for a hobby, Creative Illustration is a real professional course in the subject, worth many times its price.' 300 pages divided into seven sections: Line, Tone and Color were the three introductory parts. Then 4 sections - Telling the Story, Creating Ideas, Fields of Illustration, and Experimenting and Studies. 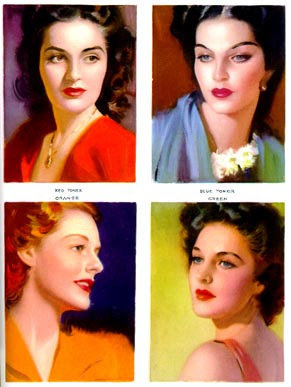 The Color section was in colour - not common in 1947. The book is filled with instructions, tips, insider experiences, and vivid illustrations. One seller, who claims thah he has sold more art books by Loomis than anyone else says:' Every chapter, every page, every picture is prime information for the artist and Loomis manages to convey it clearly and concisely. Creative Illustration is a dynamite book!' Art students and designers used to bring Loomis books back from America years ago, more as a period piece or as kitsch and I had thought it passé but it's still going strong. In this Post Modern age no style ever seems to go out of fashion - somewhere people are still going crazy about Art Deco or Memphis or muttering about Wiener Werkstatte, so Loomis is still as wanted as he ever was.